We upgraded our original print head to make it more precise, leak-proof and light weight! The print head 2.0 is equipped with new screw that was optimized for more stable clay extrusion. You can order it in our store. It is supplied with all our equipment, including Ceramic 3D Printing KITs and popular Clay Printer StoneFlower 3.0. Upon redesign of the extruder, we focused at totally leak-proof screw, with high precision and stability of the flow up to low feed rates. 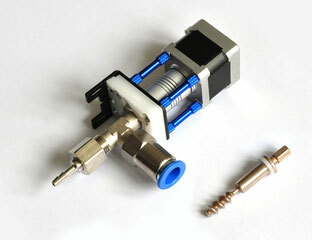 We added easily replaceable self-lubricating seal, and reduced the clearance. Several test screws were 3d-printed from wear-resistant stainless steel and tested (https://wikifactory.com/@stoneflower3d/multimaterial-3d-printing). New design stays not only as robust as the previous one, but also is completely compatible with the previous version of the print head. Thus, the owners of our printers and KITs will be able to upgrade them with new components at low cost.